Info: IS THE FIREFLY FOR YOU? 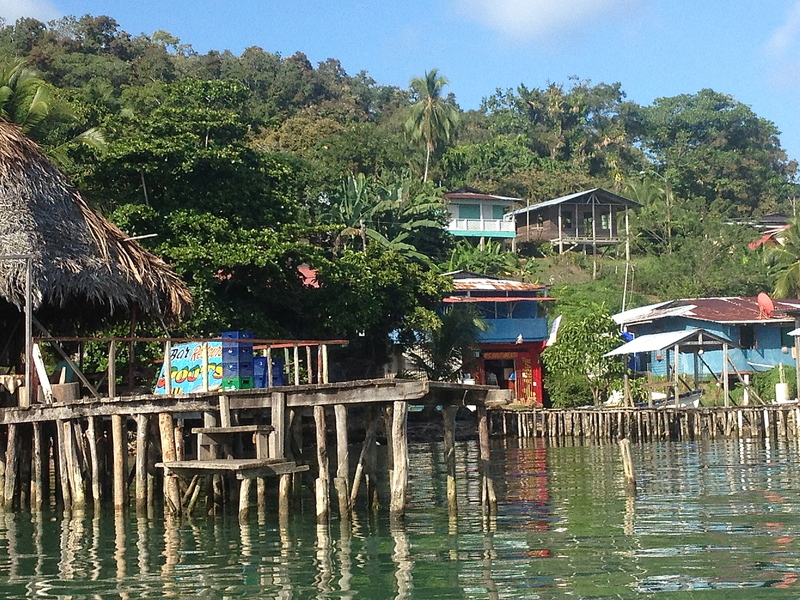 We are located on Isla Bastimentos in Bocas Del Toro, a quick, 8 minute boat ride away from Bocas Town with plenty of water taxis going back and forth between the islands. The water taxi ride is $3 per person each way and $5 after dark. Once in Bastimentos, we are a 10 minute walk from the public water taxi dock (also known as “the park”) in the middle of Old Bank. OR we are a 5 minute walk from “Cholo’s Dock”/The Firefly dock (4th dock in). You can tell your boat driver to drop you off here for a shorter walk. Our employee, Rene will also be able to spot you from this dock and help you with luggage if he’s not out on a tour. Do note that you will be walking on sand and a rocky path to get to us so having a ton of heavy luggage isn’t advisable. The Point of Bastimentos. Cholo’s dock is just to the right. Old Bank sits on a calm bay where the local people live in houses that sit in the hill or out over the water. We are around the point from Old Bank, sitting on the ocean, not the bay. Because of this, our breeze is near constant and the ocean our front yard. At night, the waves can be heard from your room. Bastimentos has a very chill, caribbean vibe not found on the other islands. Locals here are Afro-Caribbean descendants of Jamaican immigrant workers hired to work on the banana plantations in the early 1900s. 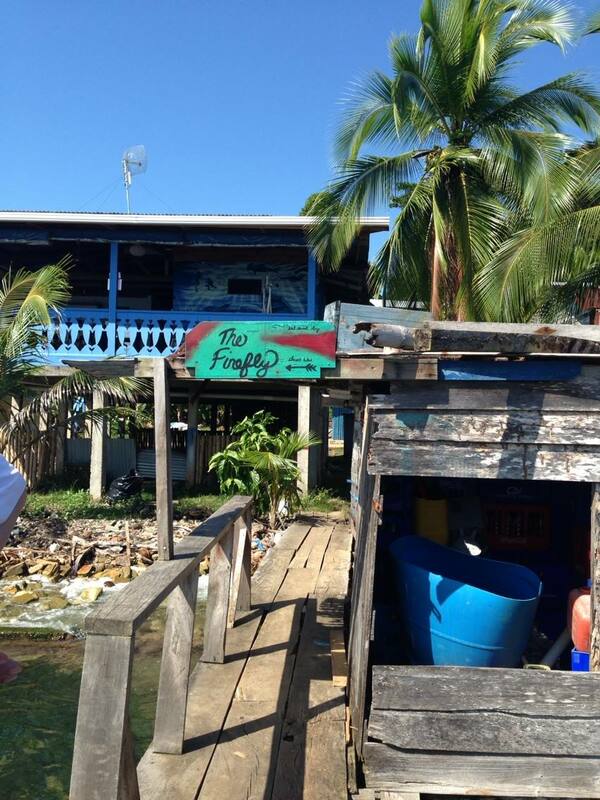 The locals here speak Guari Guari, also sometimes referred to as creole English, but really the language is patois English blended with Spanish and Guayamí (Ngobe-Buglé) words. 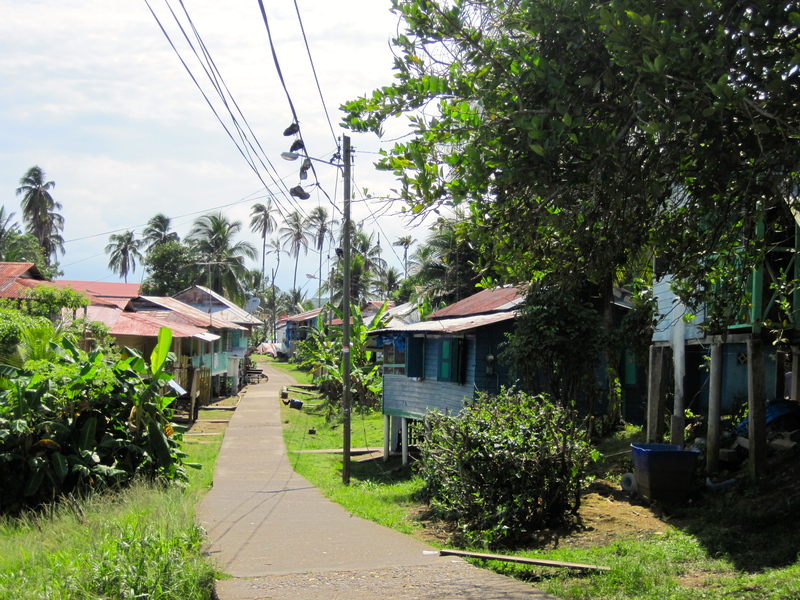 Bastimentos is an island of no roads, just a sidewalk running through town. There is a very small beach by our property which sometimes disappears when the tide is high. There is also a swimming hole cleared of rocks to allow swimming access when the water is flat. Water shoes are still a good bet to bring with you as the entry is rocky. 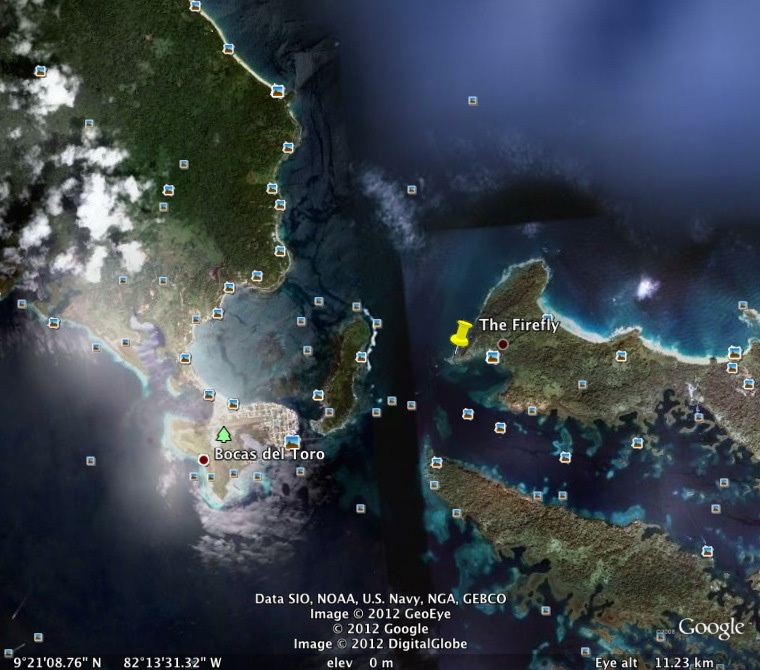 Snorkeling & SUP can be done directly in front of The Firefly when the water is calm. 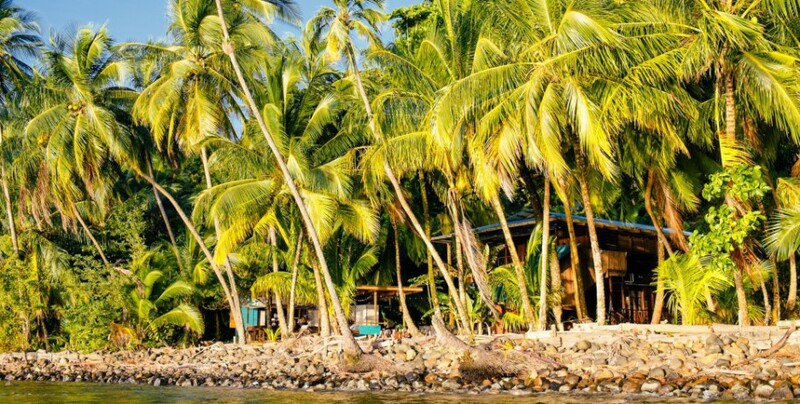 In 1988, the first marine reserve in Panama was created – the Bastimentos Island National Marine Park. A 33,000 acre park with stunning underwater scenery. Because of this, development has been slow on Bastimentos, keeping its natural beauty and jungle scenery. Bastimentos also provides the ideal location, close to town yet feeling as if you are in your own jungle paradise. 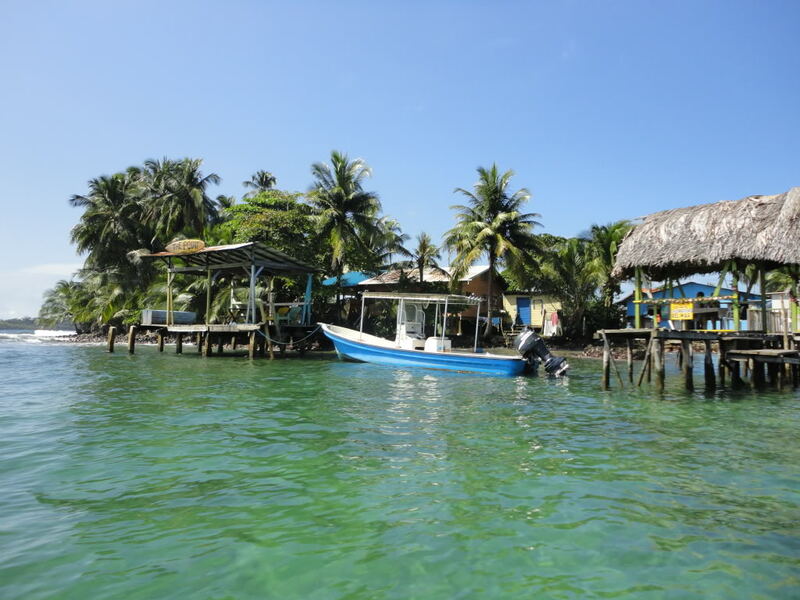 If you enjoy the buzz of bars & restaurants in Bocas Town, yet want to come back to something a bit more untouched, natural & less touristy, we are the perfect option. Our property sits directly on the Caribbean and the popular beaches of Red Frog & Turtle beach are a short boat ride away. If you’re feeling adventurous, you can hike the 35 minutes to Wizard Beach through the beautiful interior of the island. There’s also a popular hike to the organic farm & cafe called Up In The Hill. Bastimentos also has the island’s only zip line canopy tour. Just a few minutes walk away from The Firefly are several restaurants, including local favorites Alvin & Kecha, Chavela & Mom’s Place. There are also 2 convenience stores in Old Bank and a police station. Not everyone knows Cholo’s dock, so if taken to the public dock in Basti, turn left onto the sidewalk path. Walk about 5 minutes until you get to an Adventista Church on the right, a light colored cement structure. It doesn’t look like a church so look carefully; ADVENTISTA is painted on it. There is a small cement path just before the church. 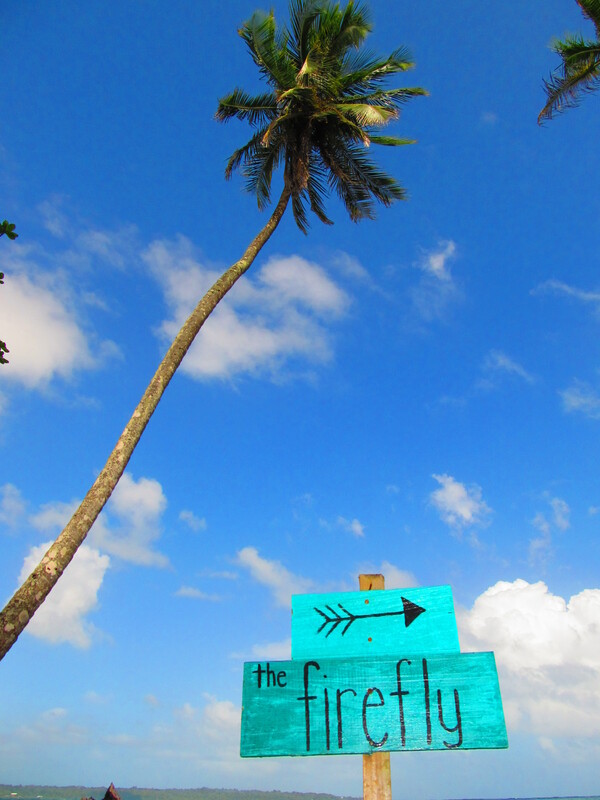 Look for our teal FIREFLY sign on the pole. Turn right onto the path and you will see the ocean ahead in front of you. Look for our arrow. When you reach the ocean turn right again and you will be able to see us down a bit nestled in the palms. At night, we are pretty well lit and easy to spot once on the ocean path. From “The Firefly/Cholo’s dock”…turn left onto the sidewalk. The directions are the same, however from this dock the church/cement path is pretty much right there on your right. Look for our sign on the pole.